Knight made his major league debut with Cincinnati as a September call-up in 1974. He spent all of 1975 and 1976 with the triple A Indianapolis Indians before returning to the majors in 1977. During that time, the Reds won both World Series titles. Knight was a .232 hitter with two home runs and 19 runs batted in when he assumed the role of starting third baseman for the "Big Red Machine" following Rose's defection to the Philadelphia Phillies in 1979. Knight responded with a .318 Batting average, ten home runs 79 RBIs and 64 runs scored to finish fifth in National League Most Valuable Player balloting. On May 13, 1980, Knight broke out of an 0-for-15 slump by homering twice in the fifth inning of a 15-4 win over the Mets. He was the first Red to ever hit two home runs in one inning. Aaron Boone matched the feat August 9, 2002. He made his first All-star appearance in 1980, hitting a single off Tommy John in his first at-bat. In 1981, Knight batted .259 with six home runs and 34 RBIs. Following the season, he was traded to the Houston Astros for César Cedeño to accommodate Johnny Bench's move from behind the plate to third. Knight split his time between third and first base with the Astros. He made the All Star team once again in 1982, and was used at third base in the game. However, he made more appearances at first than he did at third during the regular season (96 to 67). After batting .304 in 1983, Knight was batting only .237 in 1984, and had fallen out of favor with the Astros' organization when he was traded on August 28, 1984 to the New York Mets for three players to be named later. Knight platooned third base with the newly acquired Howard Johnson for the 1985 and 1986 seasons. In his first full season with the Mets, Knight batted only .218 with six home runs and 36 RBIs. During the off-season, the Mets attempted to trade Knight to the Pittsburgh Pirates for Lee Mazzilli, but were denied. Knight came out of the gate eager to prove the Mets wrong, crushing six home runs and batting .306 with twelve RBIs in the month of April. On July 22, Knight incited a bench clearing brawl at Riverfront Stadium against his former teammates. Eric Davis pinch-running for Reds player/manager Pete Rose in the tenth inning stole second and third base. Knight took the throw from Mets catcher Gary Carter late, brought his glove to Davis' face and knocked his helmet off. A stare off ensued, followed by a right cross from Knight. The benches emptied and as a result of all the ejections from this fight, back-up catcher Ed Hearn was brought into the game, and Carter moved from behind the plate to third. Roger McDowell replaced Jesse Orosco on the mound, and Orosco went into right field. They traded positions with two outs in the eleventh, and McDowell traded positions with left fielder Mookie Wilson with one out in the 12th. This rotation continued for the remainder of the game, which the Mets won in fourteen innings. The Mets won 108 games in 1986 and took the National League East convincingly by 21.5 games over the Phillies. For the season, Knight batted .298 with eleven home runs and 76 RBIs to earn NL Comeback Player of the Year honors. Knight batted only .167 in the 1986 National League Championship Series against his former teammates, the Houston Astros. In the World Series, however, Knight broke out with a .391 batting average and five RBIs. The Mets won the 1986 World Series in seven games over the Boston Red Sox. Knight's single in the now-legendary tenth inning of game six of the Series drove in Gary Carter for the first run of the inning, and also pushed Kevin Mitchell to third, allowing him to score on Bob Stanley's wild pitch. Knight then scored the winning run from second after Mookie Wilson's ground ball went through the legs of Bill Buckner, and Knight's celebration as he rounded third to score was one of the indelible images of the series. He hit the tiebreaking home run in game seven, and was rewarded with the World Series MVP award and the Baseball Writers Association of America's Babe Ruth Award for the best performance in the World Series. Unable to agree on a contract with general manager Frank Cashen for 1987, Knight earned the distinction of becoming the first player to join a new team the season after winning the World Series MVP award, signing with the Baltimore Orioles. The Orioles finished sixth in the American League East in 1987, narrowly avoiding a hundred losses (95). For his own part, Knight batted .256 with 65 RBIs and tied his career high with fourteen home runs. Following the season, he was traded to the Detroit Tigers for pitcher Mark Thurmond. Knight served primarily as the Tigers' first baseman or designated hitter, though he did see some playing time at third and in the outfield. Knight batted only .217 with three home runs, and retired at the end of the season. Seasons Games AB Runs Hits 2B 3B HR RBI SB BB SO HBP Avg. Slg. Upon retiring from baseball, Knight became an ESPN broadcaster. He accepted his first coaching job with the Reds in 1993. Early in the 1995 season, Reds owner Marge Schott announced that Knight would replace Davey Johnson as manager of the Reds in 1996 regardless of how the Reds did. Schott and Johnson had never gotten along, and relations between the two had deteriorated to the point that she almost fired Johnson after the 1994 season. However, the Reds were doing so well under Johnson (they led the National League Central at the time of the 1994 Major League Baseball strike and won the division in 1995) that she instead opted to name Knight as assistant manager, with the understanding that he would succeed Johnson in 1996. Knight managed the Reds from 1996 to bunt at an inopportune time. He later fined himself $250 for the incident. The team's lack of success would lead to his firing midway through the 1997 season in favor of Jack McKeon. 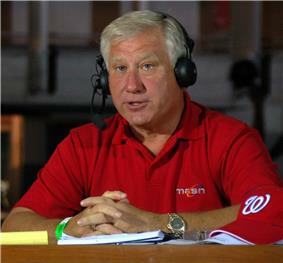 Knight is currently a broadcaster with the Washington Nationals, and hosts Nats Xtra, MASN's pregame and postgame show. Johnny Holliday, Knight's fellow MASN broadcaster, has playfully referred to him as the "Silver Fox." Ray Knight was previously married to The Villages, Florida. He also has a son from a previous marriage, Brooks Knight. Knight is a member of the Golden Gloves boxing association. ^ "Cincinnati Reds 5, San Diego Padres 2". 1974-09-10. ^ "Cincinnati Reds 15, New York Mets 4". 1980-05-13. ^ "Two Home Runs in One Inning". ^ "1980 All Star Game". 1980-07-08. ^ "Best of the bunch. Mets no strangers to fisticuffs on the diamond". Retrieved 2008-02-27. ^ "1986 World Series, Game Six". 1986-10-25. ^ "86 Mets reunite at Shea". 2006-08-19.